Over the past several months, I have had buyers ask me "what does it cost to build a home?" I have to think every home builder who has ever built a single home for sale cringes at the thought of a real estate agent answering the question of what does it cost to build a home, but I think I have an answer that even builders will tolerate. As my Dad the architect always answers (when asked a similar generic question on cost), "how long is a piece of string?" Though I'm the fourth slowest of his five boys, I think he answered the question with a question to suggest that it was far too vague of a question to answer. So, what does it cost to build a home? Well, what kind of home do you want to build? What kind of appliances? On what land? With what improvements? Can you see that in general, this kind of question really cannot be answered without all parties jumping to a whole lot of conclusions. And where will that get you? If you want to know what it costs to build a home the way you want it built, you really have to price out a plan with a detailed spec sheet. What Does It Cost To Build A Home In Tallahassee? 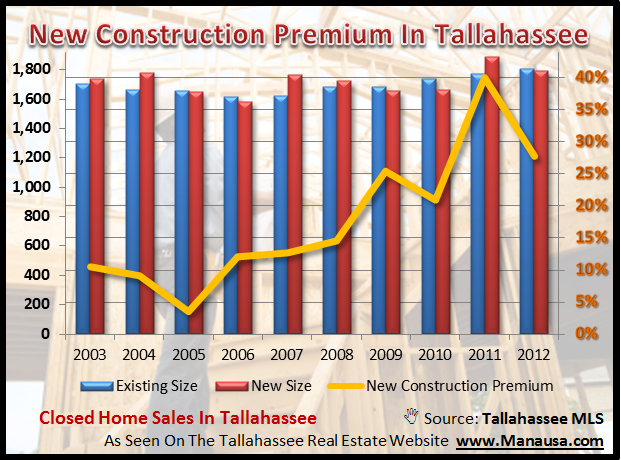 Though we might not be able to give you an exact answer on what does it cost to build a home in Tallahassee, we can sure take a comparative look and see the relative cost of new construction in Tallahassee. 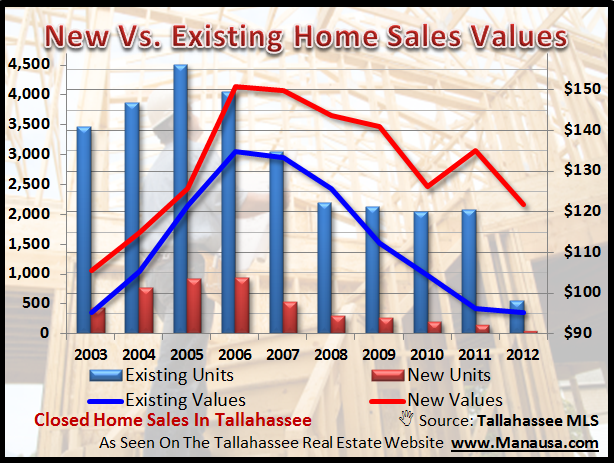 The real estate graph above shows the number of new homes sold each year, as well as the number of existing home sales in Tallahassee. New values are shown with a red line, while existing values are plotted in blue. Note the large difference (comparatively) between new construction now versus ten years ago. We can estimate the new construction premium by taking the information from the graph above and showing it in a little different manner. This real estate graph shows that currently, a new construction home is roughly 28% more than a similarly sized existing home. Again, this is not comparing apples to apples (or strings of different lengths), but it does give you a feel for now versus the past on the relative difference of building versus buying an existing home. So, if you want to know how long a piece of string is, call my Dad. But if you want to know what does it cost to build a home, just drop me a note and I can help you assemble a plan to save you a whole lot of money.